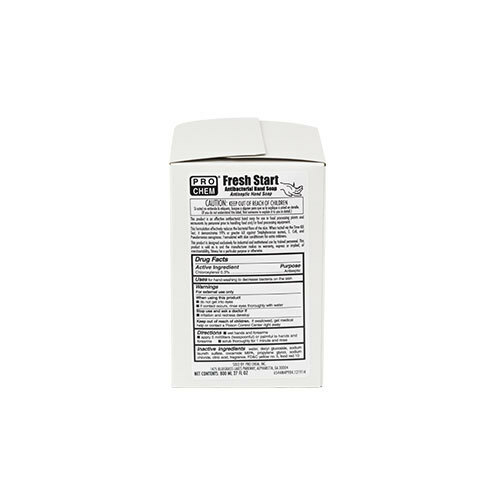 Fresh Start | Pro Chem, Inc.
FRESH START is a blend of carefully chosen biodegradable cleaners formulated for hand cleaning without removing the invisible protecting oils. It cleans and conditions your skin with a luxurious lather, which is easy to rinse. Leaves your hands clean, soft and with a fresh scent. Available in two different formulas: pink lotion (general purpose) and antibacterial. There is also a hand sanitizer available for use in the Fresh Start Dispenser. Use a small quantity of hand soap. Rub briskly working into palms of hands between fingers. Rinse thoroughly with water.